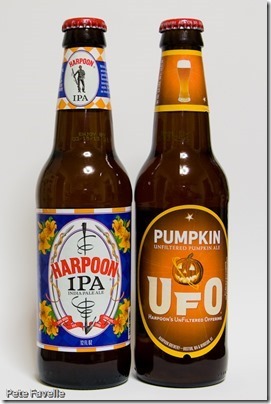 On a recent business trip to Boston, the lovely Kavey kindly brought me back some local(ish) beer. 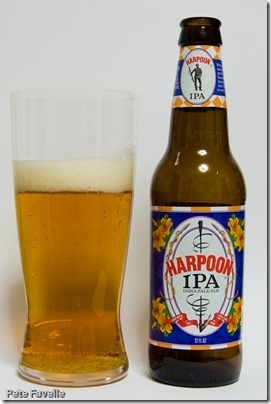 The Harpoon Brewery is based in Boston itself, although it also owns a second site up in Vermont. 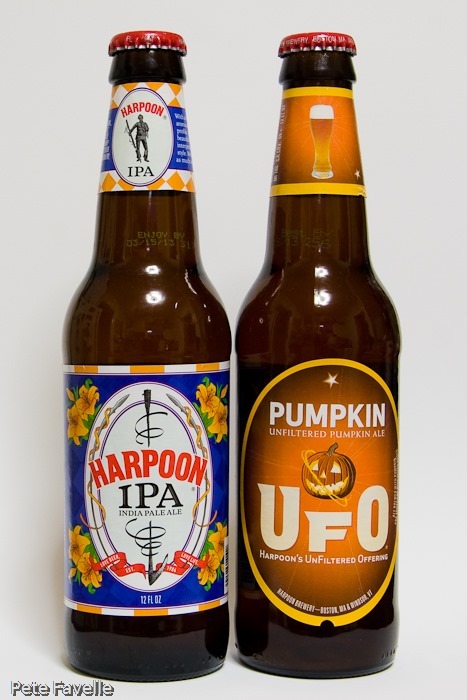 They appear to have quite an impressive range, but understandably it wasn’t possible to fit more than a couple of bottles into the luggage – one of their IPAs, and a rather irresistible bottle of pumpkin beer. 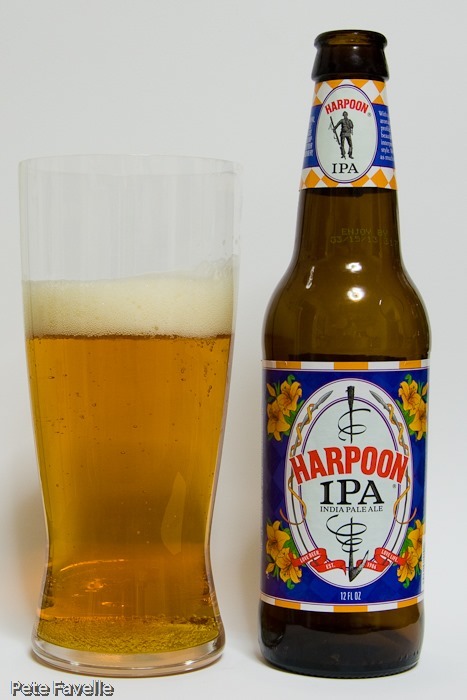 First up is the Harpoon IPA, a 5.9% ale that started life as a seasonal special and which has gone on to become Harpoon’s best selling beer. It certainly looks good in the glass, with a beautifully clear golden colour and a rich, lingering foamy head. The nose is sweet, with plenty of hop fruit and sweet clementine that is reminiscent of Refreshers. In the mouth, the initial impression is one of fizz; this is a heavily carbonated beer. There’s an orangey flavour to start, but the sweetness of the nose is lost and all the flavours are muted. The finish is dry, but without a great deal of hoppiness or bitterness. It’s surprisingly (and rather disappointingly) reserved for an IPA. 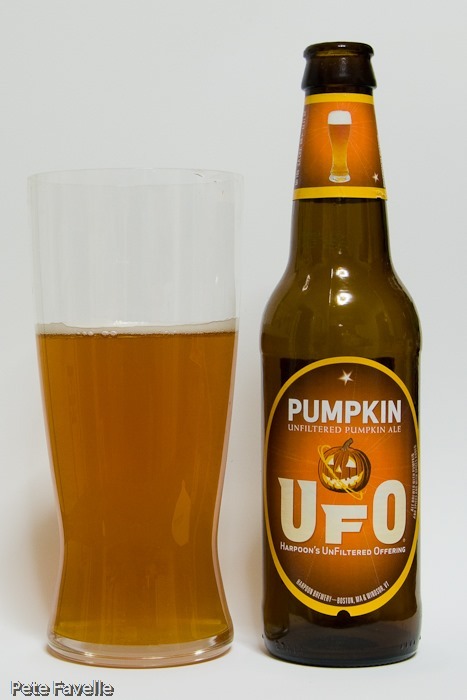 The second bottle is the Pumpkin UFO, another 5.9% ale. This is (obviously) a seasonal autumnal beer, with the UFO in the name standing for UnFiltered. Despite that, I actually managed to pour it nicely clear until the last moment, when I somehow picked up all the sediment and ended up with it in the glass! The nose is heavy on spices – coriander seed, earthy fruits and yes, pumpkin. Something about the aroma reminds me of Mr Matey bubble bath, although my wife looked at me as if I was insane when I said this.